Apparently not. Predictions are already being made and sites like Bovoda already have their odds for the event listed now — and are taking bets on the action. No matter who you trust, the Denver Broncos seem to be favored — as do my beloved Green Bay Packers. Teams like the Tennessee Titans and Jacksonville’s Jaguars (despite the optimism) appear on the bottom of every list I’ve seen. Of course, it’s football, man-not-machines, so who can really tell yet… That’s what makes the game — and betting on it — so exciting. 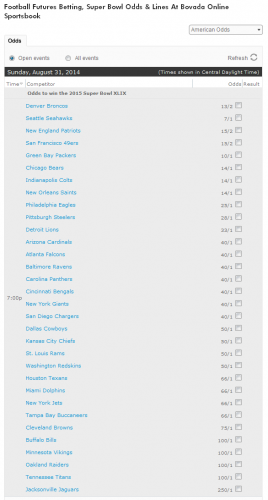 This entry was posted in Games and tagged football, online gambling, sports. Bookmark the permalink.